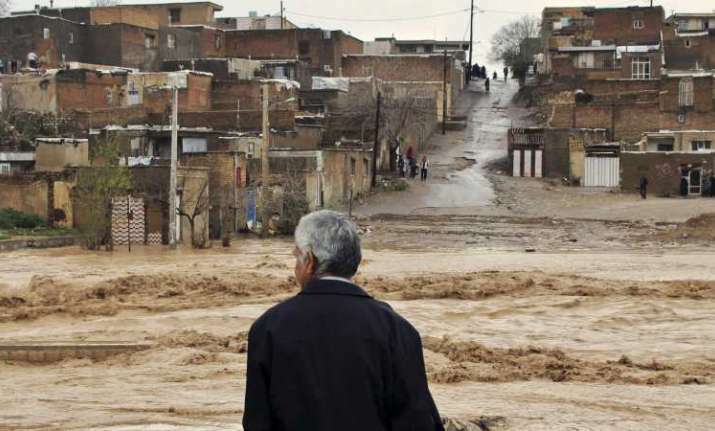 A man watches the floodwaters while it hit the city of Khorramabad, Iran. Atleast 76 people were killed while hundreds were left injured by the recent flood in Iran, according to a new toll published. According to Xinhua, Officials have warned that even though floodwaters are receding, flood alerts remain in place across a few provinces. There is a possibility that flash flood could still affect the southeastern provinces of Fars, Hormozgan, Sistan, and Baluchestan as well as the northeastern regions of South Khorasan and Khorasan Razavi provinces, Ahad Vazifeh, an official with Iran's Meteorological Oraganisation, said. Apart from this, Khuzestan may be hit with a fresh spell of rains, he added. In Iran, 25 out of 31 provinces have been affected by floods with thousands of people being missing from their homes since March 19.